Your wedding at Avery Point in Groton can be an informal seaside wedding on the lawn or a more formal wedding in the Branford House Mansion. From Avery Point in Groton, CT you can see at least three lighthouses, Long Island Sound, the Thames River, sailboats, ferries, and even the occasional submarine. Avery Point is home to a branch of the University of Connecticut (AveryPoint.UConn.Edu), Project Oceanology (WWW.Oceanology.Org), and Avery Point Lighthouse. There is a Google Map of Avery Point near the bottom of this Page. The Branford House Mansion, part of UConn Avery Point, is an excellent place for weddings! Some people call it the "Wedding Castle near Groton, Connecticut." Because of the historic nature of the Branford Mansion, there are some stringent rules for Branford Mansion weddings. Other parts of the Avery Point Campus, such as the gazebo, are less strict. In one photo the bride and groom are discussing last-minute preparations for their seaside wedding with their caterer. The view is from the water side of the Branford Mansion, looking north. The restored Avery Point Lighthouse is one of the three lighthouses easily visible from Avery Point. The other two are New London Ledge Light (actually also in Groton!) and New London Harbor Light, on the West Bank of the Thames River. In Connecticut we pronounce "Thames" just as it is spelled, with a long a. Visitors from England find it quaint that we don't pronounce "Thames" as "Tems", like they do. 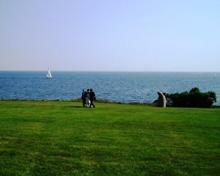 There are acres of lawn overlooking Long Island Sound and the Thames River, with several islands, lighthouses, sailboats, ferries, and other boats (and the occasional submarine) visible without binoculars. 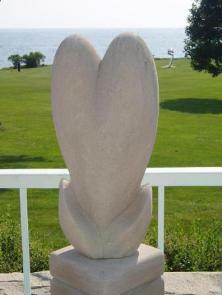 Scattered around the grounds are sculptures, both representational and abstract. The University of Connecticut at Avery Point (UConn Avery Point) has constructed what they call Sculpture Path by the Sea to enhance public accessibility. The walkways meander long the edge of the Avery Point Campus, taking you and your guests to sculptures, the lighthouse, and an observation deck. It's worthwhile visiting even if you don't plan to get married at Avery Point! Please be aware that the Branford Mansion usually has only one event per day, and is often booked more than a year ahead in the months of May, June, and July. 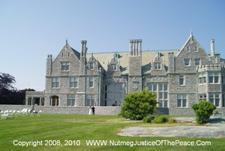 You can reach the Branford House Mansion directly at (860) 405-9072. 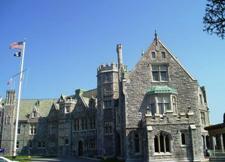 The Branford Mansion's official Web Site is averypoint.uconn.edu/branford. The street address of UConn Avery Point is 1084 Shennocossett Road, Groton, CT 06340 USA. 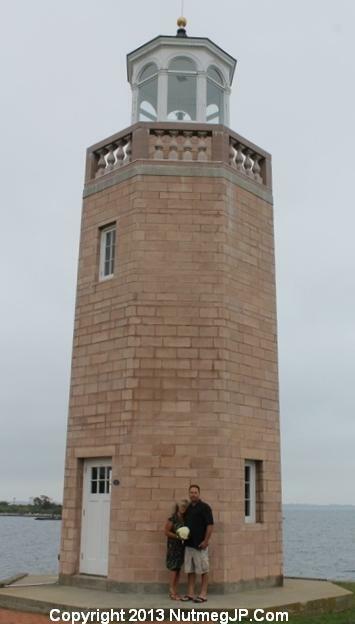 The Avery Point Lighthouse Society Site (AveryPointLight.Com) has pictures of the restoration of the Lighthouse. 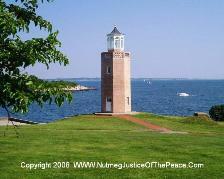 There are several other places with lighthouses along the Connecticut coast suitable for a shoreline wedding. Pictures of the Stonington Lighthouse Museum, in the Borough of Stonington, are on the Stonington, Connecticut Page, and other lighthouse wedding photos from Lighthouse Point Park in New Haven, Connecticut are on my Lighthouse Point Park Page. In addition to Groton, CT and Stonington, CT there are many nice places for weddings in New London County. Harkness State Park, Mystic Aquarium, Mystic Seaport, Rocky Neck State Park, and Gillette Castle, just to name a few places, are popular for New London County weddings. If there is no map shown above, or you would like to see a larger version, please click on View Larger Map (will open in new window).